Zona Alta Gracia, bezpieczna okolica 300m od Parku Güell, z parkingiem! 60m2 apartament z dwoma sypialniami z 12 m2, kuchnia z żywym 25 m2, łazienka i „patio” wewnątrz (Winter Garden) 9 m2 (Co clop dym na zewnątrz mieszkania ) ... Mając dużo rodzin z dziećmi w wieku niemowlęcym, wolę apartamenty dla niepalących dla dobrego samopoczucia i zdrowia wszystkich! To mieszkanie jest w pełni wyposażone, 42-calowy telewizor LED, odtwarzacz DVD, francuski i zagranicznych kanałów dwie przypowieści. 15-calowy laptop jest dostępny. I stereo CD / radio / odtwarzacz iPod, bezprzewodowy dostęp do Internetu z prędkością i telefon stacjonarny (nieograniczone darmowe rozmowy na stałe w krajowych i zadzwonić do recepcji dla zagranicy) rozkładaną sofą (2 osoby), stół ( 4-6 osób) oraz jednostki pamięci. Ten apartament wyposażony jest również w centralne ogrzewanie. Dwie sypialnie z nową pościelą i jakością (150 x 200), szafki nocne, biurko i szafa, budzik, 4 wentylatory sufitowe. W pełni wyposażona kuchnia, płyta grzejna, piekarnik, kuchenka mikrofalowa, lodówka / zamrażarka, oraz kawy espresso opiekacz, bouillard robota maszyna do mycia (6 kg). I wszystkie naczynia kuchenne. (Cook słowo)! Łazienka z wanną z hydromasażem, WC, bidet, umywalka, szafki do przechowywania. Obszar ten jest przede wszystkim mieszkalnych, Quiet olimpijczyk i pewnie! (Mieszkam obok, siarczany uwierzcie mi). Niemniej masz supermarket 50 metrów i bary, kawiarnie, Tapas 75 metrów. Na 200 metrach jesteście na alei Vallcarca tak wiele sklepów. Zielona linia (L3) metra jest dostępny (300m). Lesseps lub Vallcarca (4 stacje Paseo de Gracia 5 stacji od placu Catalunya). Wszystko w 15 minut! Trzeba również autobus miejski autobus sąsiedztwa i 200 metrów od apartamentu. Ale znowu najbardziej interesujące jest to, że udać się bezpośrednio do mieszkania w Parku Guell w schody ruchome (7 minut)! Ten wpis jest bezpłatny, od września 2013 roku o 8 € (aby wprowadzić sercu Parku jest wymagana) .Powierzchnia reszta parku jest bezpłatny. Od tam masz panoramiczny widok z Barcelony i piękno naturalnie zaparkować. Drugim najczęściej odwiedzanym zabytkiem w Barcelonie! Ten apartament znajduje się w D podłogi, drzwi nie dało się na ulicy, trzeba przedpokojem, wisienką na torcie jest to, że przeciwne (5 metrów), który posiada parkingu (prywatny garaż ) przylegający do mieszkania, więc dla turystów samochodem „Benvingut”! Każdego roku wielu urlopowiczów zastanawiać, prywatny parking ... no tu jest !!! Appartement très bien aménagé, bien situé près du parc Güell, des commerces et du métro. Accueil chaleureux de Manuk, on a tout compris ces explications sans connaître l'espagnol!!! Seul bémol, le manque de lumière même avec une fenêtre donnant sur un minuscule espace extérieur, mais ce doit être le cas de beaucoup d'appartements à Barcelone. Nous avons passé un agréable séjour dans cette ville magnifique. Nice apartment, steps form Parc Guell. Ludo was great, in terms of arranging everything for us. The apartment is clean and nice and very functional - 2 bedrooms with large beds in each, kitchen area, living room area, etc. It is clean, well-kept, and well appointed. Overall, after being out for much of the day, a nice place to come back to for relaxing and resting. 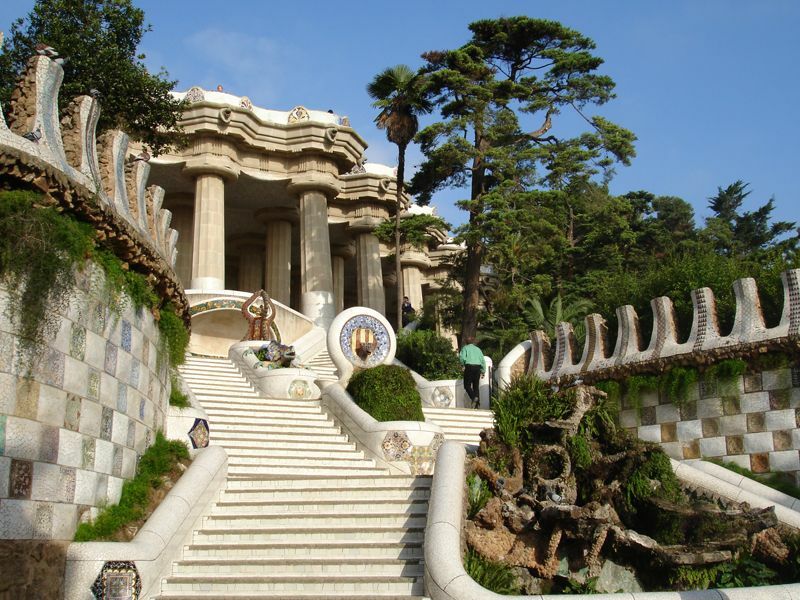 It is at the top of the hill in the Parc Guell area. Very quiet and safe. It is only a short walk to the metro as well as nearby small markets for goods and such that you might need. The kitchen is well stocked with everything you'd need if you wanted to dine in. The living room is comfortable and has games and books and a tv with international channel access in case you want to relax a little. Our stay was a combination of either walking from the apartment thru Gracia (grabbing coffee and breakfast), down La Rambla, down to Bari Gotic and the Catedral, etc. -or- walking down to the Lesseps Metro stop, grabbing breakfast at one of several good places there, and them Metro-ing to where ever our hearts desired. The area is very quiet and safe, so returns back to the apartment were nice little finishing walks up the hill to the apartment. We were met at the apartment promptly after the taxi that was arranged dropped us off from the airport, and meticulously walked thru all aspects of the apartment. Summary: very comfortable, clean, nicely appointed apartment, that is well situated to explore Barcelona from in a nice neighborhood with very good access to the metro. Ludo was great to work with in securing the apartment and being well prepared to enjoy it. We can't say anything about the restaurants in the area, we either ate in the apartment or at whatever location we were visiting during the day. Note that this neighborhood is in the hills at the edge of the city. Some of the streets are quite steep. The apartment is spacious and has comfortable beds and a good common area for relaxing and eating. This is a ground floor apartment in the city, so it only has one real window. It also has windows into the 'light well' area of the building. We were happy to use the private washing machine in that area. We were able to cook several evening meals in the apartment. Like any kitchen that is not your own, we had to 'make-do' for some things (hint: check in the bottom of the dish cupboard for bowls and glass oven pans). Ludo's associate Manuk was very helpful and efficient. He explained everything about the apartment. In Spanish. We are American, and do not speak Spanish well, but he was able to make himself understood. Manuk was on-time to check us out when we left, and arranged the private taxi service that delivered us to the airport. Ludo was out of town, but checked in with us twice by phone to make sure that all was well. He was very accommodating and flexible when our daughter joined us in the apartment for a few days. Remember to check your contract! You will need cash when you arrive at the door, for the security deposit and the city tax and the cleaning fee, and possibly other items. Very nice two bedroom apartment. Unfortunately our experience was negatively influenced by no one being at the apartment to greet us, so we were left out on the street in a fairly deserted area for 45 minutes on a cold misty day. Ludo may coordinate and speak some English, but we never saw him, and his assistant, who showed up late doesn't speak any English, so it was an unpleasant initial impression. After we got settled in it was fine, and Manuck showed up right on time to assist us in our departure. The apartment is less than a 10 minute walk from the metro, so it's easy to get anywhere. Few restaurants in that area, and the streets are very steep, so it is not a good option for folks that have mobility issues. Very comfortable apartment. Beds are nice, bathroom is nice, and kitchen is well equipped. Don't expect to be able to use the TV unless you speak Spanish or French. Seems like Ludo has a French language cable package. Probably would not return. I think the tenant was very hard with us at the level of the commentary. Thank you for your comment. I had asked you to call me before when you arrive at the apartment as do the tenants, But you send me a email at 5pm (hello Ludo we just arrive at the apartment) ! Richard it's a tourist apartment no a hotel ! you received in the beginning with the contract all the informations about the check-in. I hope you liked the champagne and the discout of 50€ at the checkout, I had do for you ! And the discount at the littoral restaurant ! why you don't have put it in the commentary ??? Manuk have had to wake up at 4.30am for you to be at the apartment for the checkout and I book my taxi service. And you send me 3 emails to ask me if it's ok for the taxi ! At 6am the taxi was in front of the door of the apartment to pick you for your plane at 9.00am to go to Barcelona Prat airport ! Zwłaszcza bardzo blisko do mieszkania, nie zapomnij Guell Park (300m) i Las Aguas Carreteras dominuje całą Barcelonę pieszo lub na rowerze! 50% à la réservation, solde en espèce à l'arrivée, virement bancaire ou chèque de banque certifié. Caution 300€ (en espèce ou chèque de banque certifié) ou possibilité de laisser un passeport ou CNI dans le coffre fort de l'appartement en caution. NOTE : Si vous arrivez après 20H, merci de m'en l'informer.